one of my favorite outdoor campaigns. this one won the 2007 Cannes Best of Show Outdoor Grand Prix. i summarized the following as part of an intiative that i’m doing for my clients. enjoy! Concept: A solar powered billboard that generates 1350KW to power the kitchen of a primary school. Where: A primary school in Gauteng, the smallest province in South Africa. – 10 solar panels are installed above the billboard and connected to the school’s electricity output. – The panels can generate 1350 watts of power a day which is enough to boil 18.1 liters in domestic kettles continuously at any one time. – This enables more students under the school’s feeding scheme to receive breakfast and lunch everyday. – The billboard also holds enough batteries to store energy that allows it to be completely self-sufficient, generating enough electricity to light itself up at night. – Innovative use of existing media space – The world’s first solar powered billboard. – This billboard is environmentally-friendly as it does not require traditional electricity which is the major cause of global warming. 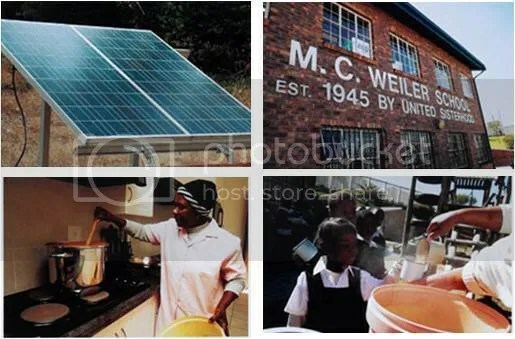 – Other than getting the bank’s message across, the billboard was also able to harness and convert the heat of the sun into a much-needed necessity in Africa – electricity – which currently powers the kitchens of a primary school and feeds 1100 kids a day. 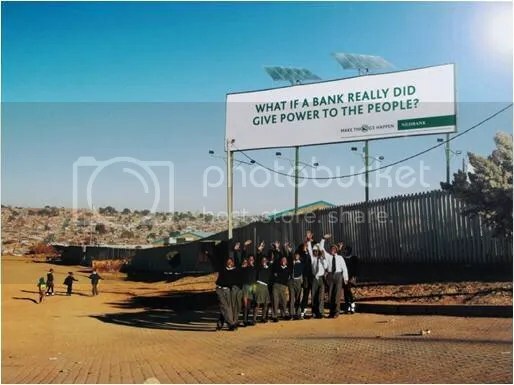 By redefining what an outdoor billboard can do, Nedbank managed to convey their corporate message in a creative way and at the same time, giving something useful back to the community.